The bells at the former St. Mary Catholic Church might soon start ringing again. Steeple Square officials this month began work on restoring the campus’ titular steeple. The church, located at 15th and White streets, has been home to a massive revitalization effort in recent years. The $2.2 million project is expected to continue throughout the summer. The effort likely will wrap up sometime in October. Along with restoring the steeple roof and exterior and installing new ladder systems for the interior, the clock and old bell system also will be brought back to life. Hagerty said the three bells in the steeple remain in good condition, but the system that operated them and the clock that timed their ringing have not worked for years. Local contractors will work on restoring both the bells and clock to working condition. Once completed, the bells will be programmed to periodically ring throughout the day, Hagerty said. Hagerty said an emphasis was placed on hiring local contractors. “We really want this to be as much of a local effort as we can make it,” Hagerty said. Mark Arnold, owner of Bluff Street Time Shop, is heading up the repair of the clock’s motor and mechanics. He said the project will be an extensive restoration effort, but he’s up to the task. Hagerty said nearly all the money for the project has been raised through private donations. 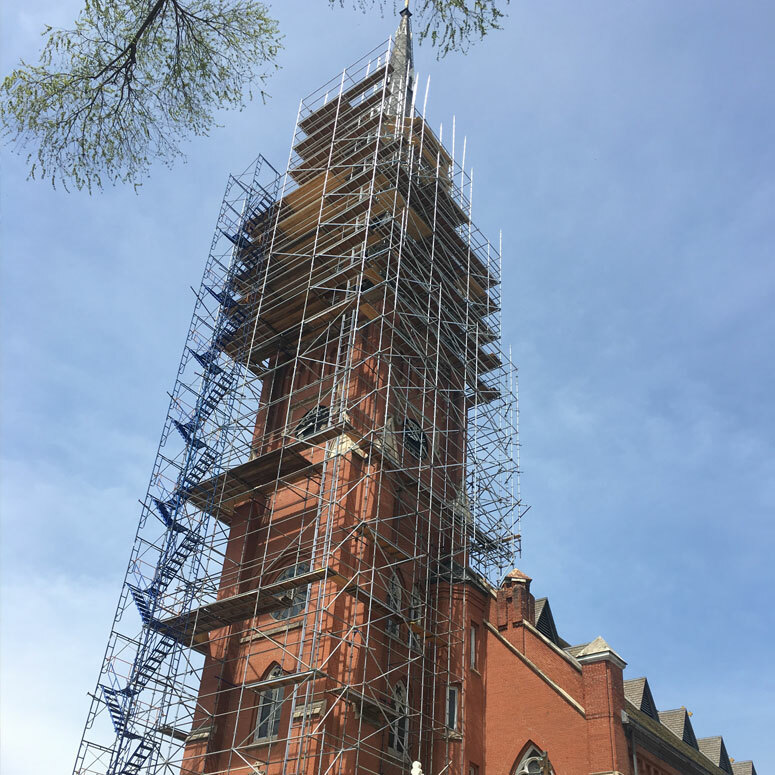 Before work on the project can begin, extensive scaffolding must be set up around the steeple to ensure the safety of the contractors. Hagerty said the scaffolding work should wrap up this month. John Schmidt, vice president of the Steeple Square Board of Directors, said the project is an essential element of the larger effort to revitalize the neighborhood surrounding the former church. One Steeple Square building has been transformed into the Francis Apartments, more than half of which serve graduates of the nearby Opening Doors. There also will be a child care center, green space and community event center. Hagerty said the restoration of the steeple has been a longtime goal for Steeple Square leaders. By JOHN KRUSE. View article online here.